Tune in to Kiss92 NOW as we are counting down to the No. 1 Song on New Year’s Eve from 5.30pm! Voting commences on 10 December 2018 (06:00) to 31 December 2018 (10:00) both dates inclusive ("Voting Period"). The voting exercise is open to all members of the public. 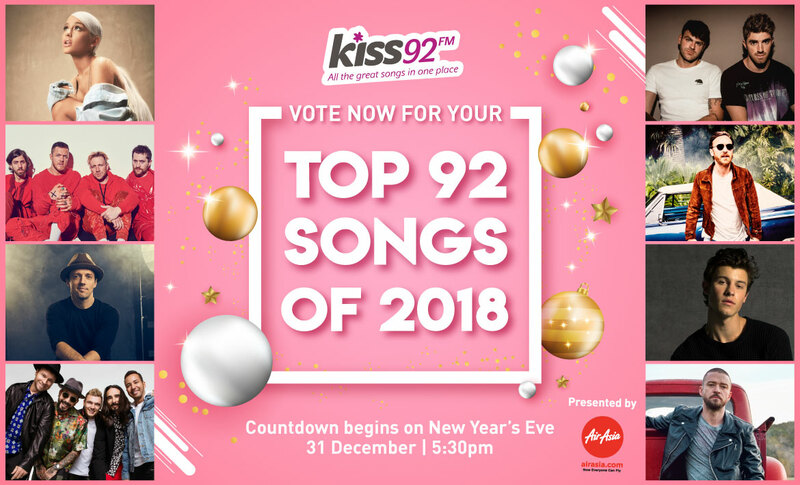 Log on to website, www.kiss92.sg/top-92-songs-of-2018/ to vote for the Top 92 Songs of 2018. The participant must fully complete his/her personal particulars online and ensure that completed particulars are accurate and true. The participant is limited to 1 submission per day, per phone number. At the end of the Campaign Period, Winners will be picked from the eligible participants through a lucky Draw ("Winners"). The winner shall agree to follow, abide by and adhere to the Rules & Regulations of SPH Radio. Click here for more information about SPH Personal Data Protection Statement (PDPA). We will need to collect and use participants' personal data, to facilitate their participation in the Countdown. Such personal data may include without limitation a participant's name, telephone number, personal identification number, as well as their age group. SPH Radio Kiss92 FM reserves the right to use the particulars of any participant in its marketing, publicity or promotional materials at SPH Radio Kiss92 FM's sole discretion without notice to the participant. By participating in this Countdown, you consent to our collection, use and disclosure of your personal data for the purposes and in the manner described above. SPH Radio Kiss92 FM's decisions on the Countdown shall be final and no correspondence will be entertained under any circumstances. In the event of a dispute, any individual's entitlement to participate in the Countdown shall be subjected to the sole discretion and final determination of SPH Radio Kiss92 FM.